Mary Alice Hinshaw1,2 [A. M. Alice Hinshaw3,4,5, Alyce Hinshaw6]. She married John William Cook, about 1910.10,13 John, son of John + Rosa P. Cook11,14,15,16,17, was born May 15 187611,14,15,16,17 [about 187910], Kansas11,14,15,16,17 [Missouri10]. Cook, John W., head-of-household, age 31, born in Missouri; parents born in England; first marriage, married 4 months; occupation: surgeon, veterinary; rented home. Cook, Alice, wife, age 28, born in Kansas; parents born in Indiana; first marriage, married 4 months; no children. Cook, John W., head-of-household, age 43, born in Kansas; parents born in England; rented home; occupation: cattle dealer. Cook, Mary A., wife, age 38, born in Kansas; parents born in Indiana. Cook, John W., son, age 3 months, born in Kansas; parents born in Kansas. Cook, J.W., head-of-household, age 48, born in Kansas; occupation: farmer. Cook, Alice, wife, age 40, born in Kansas. Cook, Morley, son, age 1, born in Kansas. 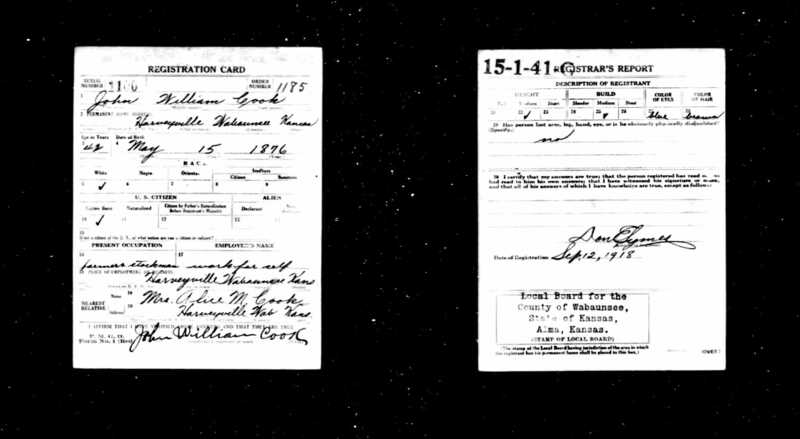 Cook, Alice, inmate, age 48, born in Kansas; parents born in Indiana; married. Cook, Rosa, head-of-household, age 80, born in England; parents born in England; immigrated 1869, naturalized; widow; owned home ($3200 value); radio in home. Cook, Morley, grandson, age 6, born in Kansas; parents born in Kansas. "Pictorial Bible", published by A.J. Holman & Co., 1886, Philadelphia. Contribution from Bruce Irving Hinshaw	/ 1881 only. 1910 census, 1st Ward, Emporia, Lyon County, Kansas; roll T624-445, ED 45, page 8B, line #66, dwelling #198, family #220. 1920 census, Harveyville, Plum Township, Wabaunsee County, Kansas; roll T625-553, ED 149, page 1A, line #34, dwelling #10, family #10. 1930 census, Topeka, Shawnee County, Kansas; ED 89-47, page 3B, line #97. Contribution from Ann Cook Yrisarri (). 1880 census, Abilene, Dickinson County, Kansas; roll T9-379, ED 66, page 390D, line #39, dwelling #120, family #120. 1900 census, Wilmington Township, Wabaunsee County, Kansas; ED 182, page 9B, line #82, dwelling #221, family #222. 1925 Kansas state census, Mission, Shawnee County, Kansas; roll KS1925-149, page 36, line #6, dwelling #273, family #282. 1930 census, Harveyville, Plum Township, Wabaunsee County, Kansas; roll T626-725, ED 14, page 1B, line #69, dwelling #22, family #23.